It’s a very common thing to buy a bathroom set. Most RTA bathroom cabinet sets have a bathroom vanity (the under-the-sink cabinet), mirror or medicine cabinet, a tank topper (small cabinet that goes above the toilet) and a linen cabinet. With larger bathrooms, there is sometimes a small standalone cabinet added as well. And those make up the extent of your bathroom storage. For families with lots of members, the storage space can get really cramped, really quickly, and your linen cabinet could be used for so much more than just storing towels and bedsheets. Since RTA bathroom cabinets come in standard sizes, the world is your oyster when choosing a cabinet set. You can check out some great designs here: https://www.rtacabinetstore.com/rta-bathroom/. When choosing your linen cabinet, you will invariably have something tall and not very large. That’s okay, though, as there are a lot of accessories you can use to get a large amount of storage out of the cabinet. The Rev-A-Shelf series of accessories have oodles of things, such as door drawers, inserts with a pole and many spinning shelves attached … the list goes on and on. 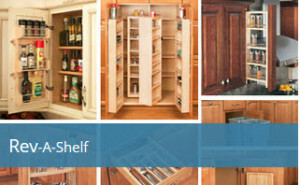 Check out some of them here: https://www.rtacabinetstore.com/RTA-Kitchen-Cabinet-Accessories/ . Storage is something that we all need, but getting organized is a pain, in a small space. A lot of linen closets have three to four shelves in them. With a little judicious use of additional shelving, each member of the family could have their own storage area, with more than enough space for everything. That will also leave more space on the countertop and inside the vanity. If you have a large enough bathroom, you could even get two linen closets, one for the super storage space, the other for actual linens! Remember, you can also accessorize the outside of the cabinets as well. A nice matching basket on top can hold decorative items to give that little extra spice to the room, and a long mirror hung on the side of the cabinet could really give the illusion of a lot more space. Just FYI, RTACabinetStore.com has three free reports that will help you optimize your cabinet design and avoid common mistakes. It can really help you with your cabinet choices, placement, and ideas! Download them now at https://www.rtacabinetstore.com/offers/free-download/.